DAY BEFORE: The forecast called for mid-90's on race day so I knew I needed to drink plenty of water ahead of time, which I did. I also ate more carbohydrates and sodium, like I usually do, to ensure adequate glycogen stores and fluid retention. My training had gone relatively well so I felt prepared. The day before the race was blistering hot. Looking back, it seems now like I never really cooled down from the few hours I spent on Saturday, dropping off my bike and gear bags, talking with friends, and watching my daughter's softball game under the blazing 97 degree sun. The sunrise was beautiful that morning! Race morning went fine. Everything was in order. or so it seemed. Little did I know that the tube to my hydration "bladder" (that Specialized Shiv bikes have) was not completely screwed in tight, which meant I would not be able to access the water in the bag. I poured water into the bladder but because I couldn't see that the straw was not completely connected like it should be, I didn't know that I would not be able to get water out of it. Huge mistake. I should have made sure that it was connected. (Note: I love this hydration system - it normally works really well). Swim: Water was choppier than I expected but nothing too bad. I zig-zagged quite a bit, but nothing too crazy. One good thing was that I didn't have any panic or anxiety as I entered the water. That made me happy. Swim time was 1:20, a little slower than I had wanted but it was fine. Overall, I was happy with the swim. Bike: The bike started off great! I felt strong and ready to go. But as soon I tried to sip water and nothing came out, I knew what was wrong. Damn it! Why didn't I check that?? My torpedo was full of sport drink so I was ok there, but the ideal way to hydrate is to consume 50% water and 50% sport drink. At that point, it wasn't super hot yet so I just kept drinking the sport drink and decided to get water at the aid stations. It would take too long to pull out the bladder and reconnect the tube. The temperature quickly rose to the upper 90's and it literally felt like we were riding inside an oven. I had never ridden in such intense heat before. The reflection of heat off the pavement made it feel even hotter which made it even worse. I grabbed water at each aid station and drank at least half the bottle. The problem was, it wasn't enough. I needed to be drinking every 15 minutes in that kind of heat. The other problem with intense heat, for me at least, is that it kills my desire to eat. I knew I needed calories but I had no desire to eat or take in any carbohydrate. I forced gels and blocks down my throat but I didn't get the amount my body needed. This would ultimately affect my speed and ability to run. I started feeling nauseous toward the end of the bike. Too much sport drink and not enough water was taking a toll and I knew it. Plus, 7.5 hours of riding in intense heat and eating very little drained most of my energy. T2 was slow. I felt dizzy, light-headed, and nauseous. I certainly didn't feel like running 26.2 miles. My legs felt OK but my GI system did not. The Run: The first 7 miles had no shade at all. I found out later that the temperature at that point was 101 degrees. I tried to run and couldn't go more than 30 seconds before stopping. I needed to throw up but nothing would come up. I shuffled the first 9 miles feeling extremely nauseated and finally, around mile 9, I threw up. I vomited several times and before I knew it, a medical person was by my side. I couldn't lift my head to even look at him. He asked me to sit down and drink some water. We sat there for a few minutes and he asked me a lot of questions. I think I answered them all but I clearly remember him saying "I'd like you to consider not finishing the race". Part of me wanted to just lay there and die but another part of me was too stubborn to let that happen. So I got up and said "nope" and kept walking. Kurt found me and walked with me for awhile and that helped a lot. I kept thinking "I'll start running here in a minute" but just couldn't do it. Being a doctor, he knew that my blood volume was low due to the dehydration, which lowers cardiac output, making it very hard to run. Two of my dearest friends also walked with me for awhile and that helped a lot. Unfortunately, I had to stop and puke and became so light-headed that I sunk to the ground. I asked for help back up but then quickly realized that could be viewed as "assisting" which is against IM rules, so I got myself up and kept walking. They peeled off around mile 15 and I felt fine enough to keep walking. But I felt worse with each passing mile and finally, around mile 19, I thought I was done. I felt almost delirious and knew i needed more water. I wanted to sit down so bad! But I also wanted that finisher's medal so somehow managed to keep walking, albeit very, very slowly. I got some water at the next aid station and sipped on it for the next mile. It was dark now and parts of the course had no light so I was walking in the dark. I thought about how many people finish this late in IM races and that I'm lucky that I'm even doing this race. This may sound crazy but the dark silence was actually calming to me and I started feeling a bit better. So I started to run. I ran for a minute or so then walked, then ran, then walked for a few miles. My legs felt fine, but I just couldn't sustain the running. Then suddenly, out of nowhere I heard Kurt's voice. He had found me on the course and we walked together again. My stomach was feeling better at mile 24 so I tried running and was able to "run" farther than before. I knew I could finish before midnight so I wasn't worried about DNF'ing but I also knew that technically, my finish time was calculated from the time I entered the water, making the 17-hour cutoff time before midnight. I just wasn't exactly sure what time I had entered the water. At that point, I didn't seem to care - I just wanted to finish. I had been walking for almost 8 hours and wasn't going to quit now. I could hear Mike Reilly at the finish line and I just wanted to get this thing DONE. I crossed the finish line at 11:42 pm. The spectators along the finisher's chute were truly amazing - I had decided I would walk down the finisher's chute since what difference would it make to run, but the spectators went wild! They were banging drums and yelling my name so I sprinted for the finish line. What else can you do when people are cheering for you like that?? I got my finisher's medal and t-shirt and headed for the car with Kurt. It was bittersweet to finish so late but I was thrilled that I made it. Definitely not the day I had planned but that's the way it goes, right? The next day I reflected on the race and knew I had a choice: I could be sad about how bad things turned out and ashamed of myself for not checking the bladder on my bike OR I could be happy that I pushed through it all to finish, no matter what finish time I ended up with. I chose the latter. Later, I saw that Ironman listed me as a DNF. It felt like a punch to the gut at first but surprisingly, I didn't really care. My finish time was 17:01:04, just a hair over the time limit (and much slower than planned), but I DID finish the race and that's all I care about. Epilogue (and lessons for newby triathletes): My major problem was getting behind on fluids during the bike and never catching up. Also, despite having plenty of nutrition with me, I did not consume it all, which means I resorted to my glycogen stores and they will deplete quickly without added carbohydrate. The major factor in this race was the extreme heat. Not just heat, but EXTREME heat, for a long period of time. It leads to heat exhaustion, which is what I had. Plus, the heat destroyed my desire to eat so I had less energy to run, much less walk. I've never had that problem in any other Ironman race because none of them were in extreme heat. You must plan ahead if you plan to race in the heat. If possible, PRACTICE by riding and running in the heat. 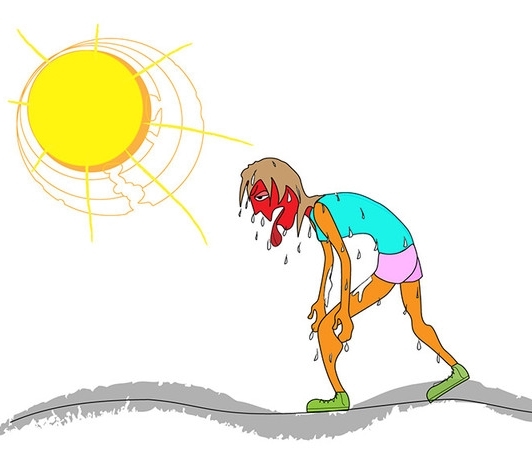 I ran with our local track club in the evenings because it was hot at that time of day but it wasn't enough. I needed to ride in the heat. Studies show it takes at least 5 consecutive days of training in heat to acclimate but that's not always possible for many athletes. Either way, plan your hydration carefully and think about what will taste good when you're hot. More on that in another blog! Happy training, y'all! Let me know if you have any questions!